From my house, you can walk to a place to get seasonal handmade pie, two places to get Japanese noodles, a place that makes their own coconut milk to mix into delicious curries, and a place that makes cecina (also called farinata, cecina is a crepe-like flatbread made of chickpea flour) in an enormous wood-fired oven. This summer, there will also be a place to get delicious French pastries and a place to get small batch ice cream. What there will not be, and what there is not now, is a place to get a scone. Perhaps due to the proliferation of coffee places that serve the type of scones that are more closely related to a slice of cake or a doughnut, there isn’t a lot of represented variety in the scone world. Most scones encountered these days are sugary, glaze-covered, or chocolate-studded, and while I certainly have no problem with a good selection of sweets being offered, it would be nice to come across the occasional savory scone. Logic leads me to believe that, this being America, the biscuit is most likely the main culprit in the obsolescence of the savory scone, but, me being me, that doesn’t mean I am going to rest easy with that knowledge. 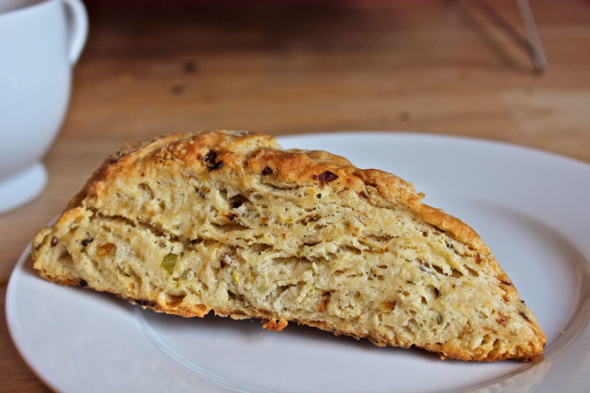 So, if you are like me, and you are interested in delving a bit deeper into the world of the non-sugary scone, might I suggest you give this delightful leek and rosemary version a try? Flaky and buttery, it’s a welcome addition to a cup of coffee or tea, and it plays very well with the warm and cozy attributes of a bowl of soup. Come to think of it, these scones, so very savory and toothsome, go great with a big, crunchy salad as well, lending a balance of heartiness to the crisp lightness of a big plate of greens. Oh, greens! You could split one of these in half and pile it high with sautéed greens—chard, collard greens, kale, what have you—making yourself a sort of hybrid sandwich that goes a long way towards making a case for the presence of the savory scone. I could keep going with this case for scones, but I think I’ve made good headway so far. 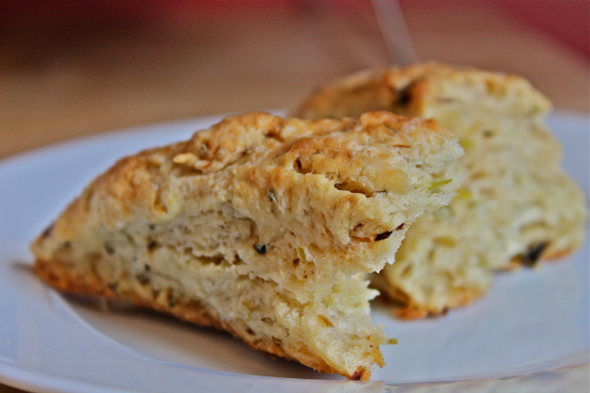 How long before a shop offering savory scones pops up near my house? I have no idea. But, so long as my kitchen and I keep up the pace, I don’t anticipate we’ll be needing the services of such a shop. Last Year: Marinated Goat Cheese and Savory Olive Oil and Walnut Sables–these go great together! 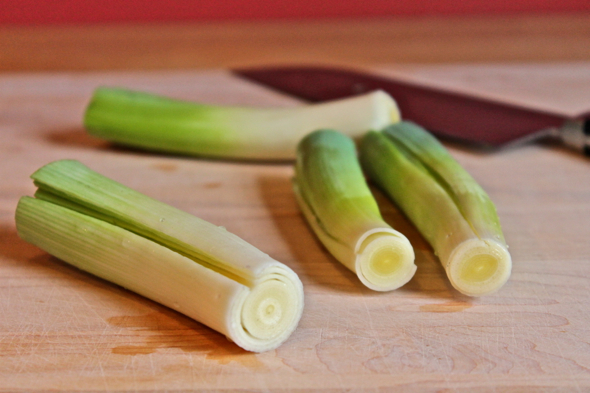 Rinse leeks thoroughly, then slice in half lengthwise. Slice each half into thin half moons. In a medium skillet, heat olive oil over medium high heat. Add leeks, then sauté, stirring occasionally, for about 5 minutes, until the leeks begin to soften. Reduce heat to low, cover leeks, and continue to cook for another 10 minutes, stirring occasionally to keep the leeks from sticking to the pan. When the leeks are touched with crisp brown edges, uncover the pan, stir for a minute or so over low heat to allow the leeks to crisp up a bit more, then remove leeks to a plate to cool. Preheat oven to 400 degrees Fahrenheit. Line a large baking sheet with parchment paper and set aside. 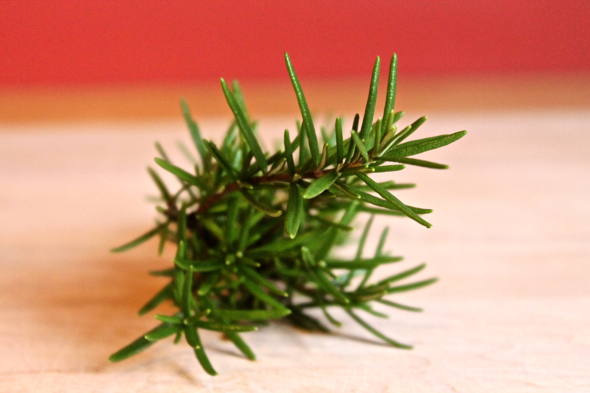 In a large bowl, combine flour, baking powder, baking soda, salt, rosemary, and lemon zest. Whisk to combine. 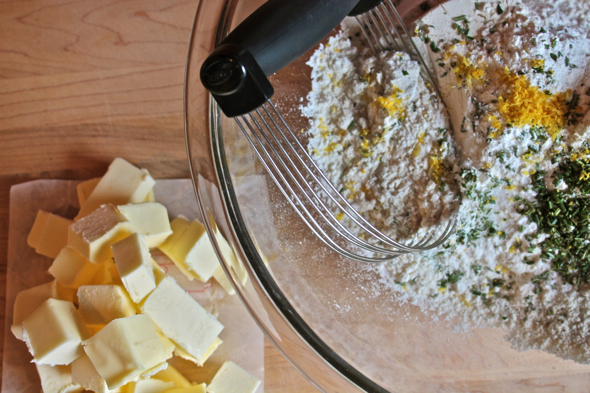 Add the cold butter chunks and, using a pastry cutter or two knives, cut the butter into the flour mixture until the mixture resembles coarse crumbs with a few large pea-sized butter bits strewn throughout. Using a wooden spoon or sturdy spatula, carefully stir in the buttermilk until the dough appears quite shaggy and just begins to hold together. Fold in the cooled leeks. Turned the dough out onto a floured surface. 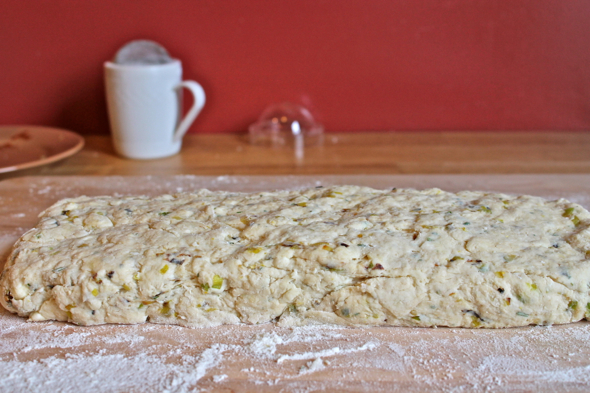 Carefully pat the dough into a long rectangle about 18 inches long and roughly 1 ½-inches thick. Using a sharp knife, cut the dough into 12 triangles. Place the dough triangles on the prepared baking sheet. You might need to partake in a bit of creative arranging in order to make all 12 triangles fit on the baking sheet. Bake in the center of the oven for 25 to 30 minutes, until the tops of the scones have turned dark golden brown. Remove scones to a wire rack to cool slightly, then serve while still warm. These look delicious, and remind me of the many sweet and savory scones i would eat growing up in the UK,, including the infamous Devon cream tea scone experience which was actually proven to shorten ones life but make it all the more enjoyable. 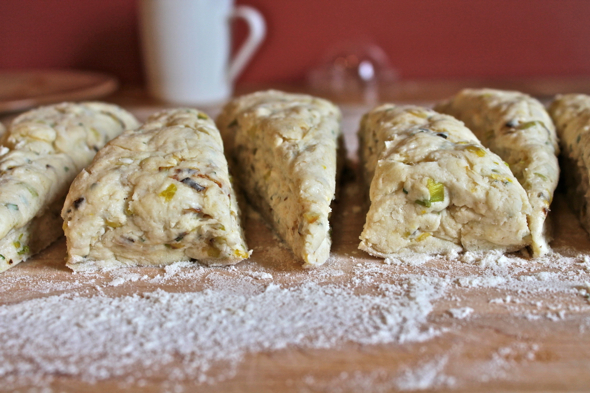 Savory scones, here I come. Great post. These look wonderful and I love the idea of topping them with sauteed greens. I agree: Oh Greens! 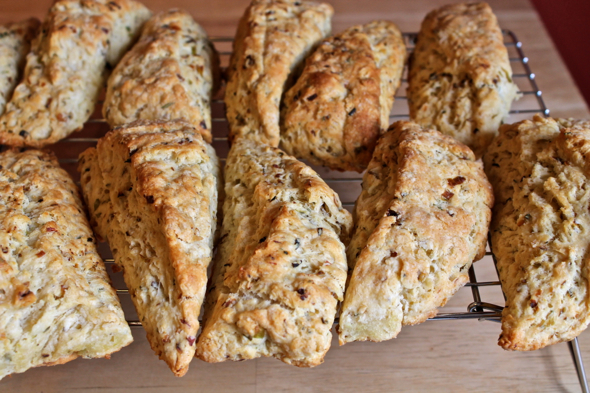 I love savory scones and they’re rare to find commercially – can’t wait to try these.